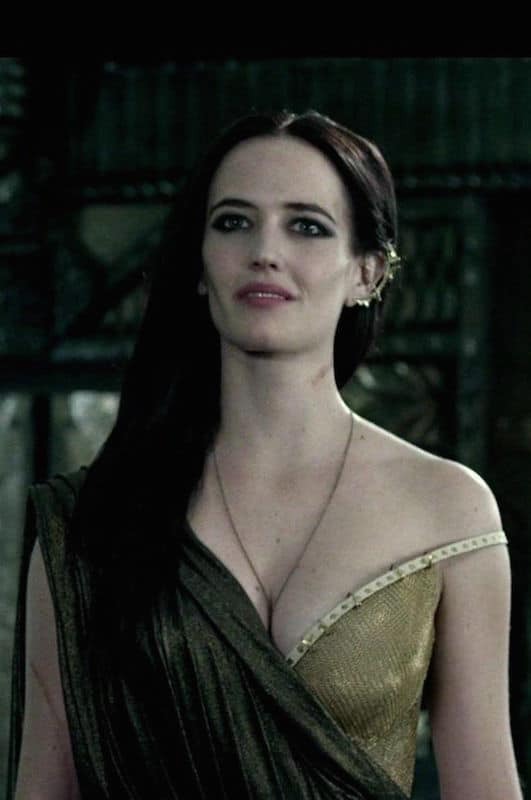 Eva Green has that fine-featured, dark haired, elegant look that I love. 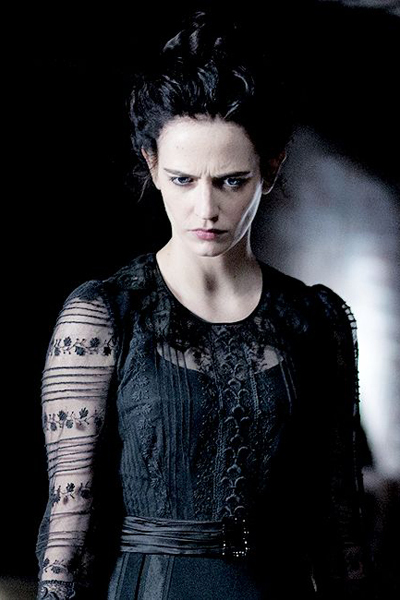 She’s perfect for gothic roles, and she wears historical styles very well. Let’s take a look at her many historical costume movie and TV roles! She’s got the neck to carry off both that necklace and the gown! 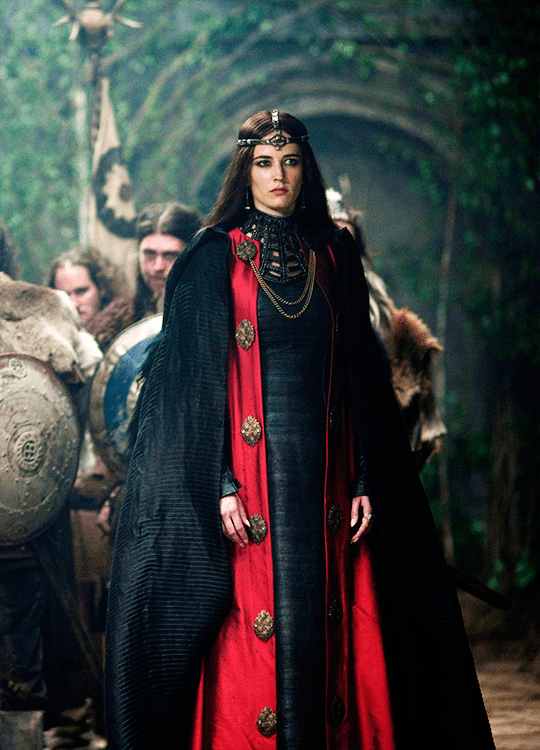 Eva plays Sibylla, Queen of Jerusalem in story about crusaders in the 12th century. This is really pretty, even if I have NO idea how historically accurate it is (my guess: not very much). As an artsy teacher at a 1930s English girls’ boarding school in this dark thriller. Her character is very bohemian and arty, so her wardrobe is fabulous. Here, the scarf and the trousers mark her as not-your-average teacher. Great colors, and love the print on the sheer fabric! She doesn’t blend in. I like the subtlety of the sweater’s pattern. Yet another, not terribly inspired, attempt at the story of King Arthur. 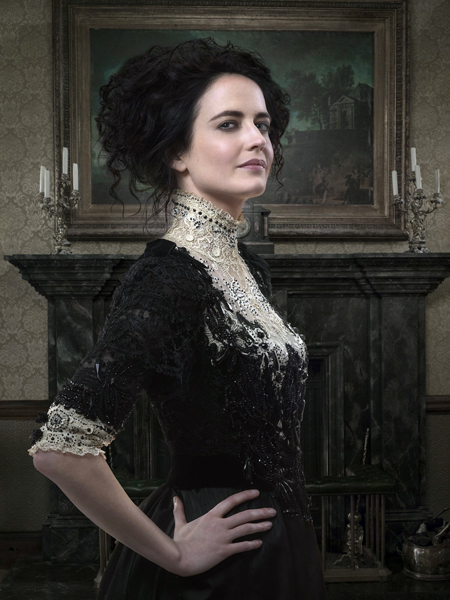 Eva is one of the best things about the show as evil sorceress Morgan. She’s a sorceress, so I guess we let the pleather and coronet slide? I mean, at least you’re not going to get confused and think she’s the ingenue! Actually I like this look the most — it’s the least heavy-handed! A film adaptation of the 1970s horror/comedy TV show. Eva plays Angelique, the spurned maid who places the curse on the Collins family. Most of the film takes place in the 1970s, but they set things up with some 1770s-set scenes. I saw the original 300 because Gerard Butler, but know nothing about this attempt at a sequel to the ancient Spartans battle movie. I’m assuming there are more abs? What did they wear in ancient Sparta? Apparently a lot of kohl. A Danish western. 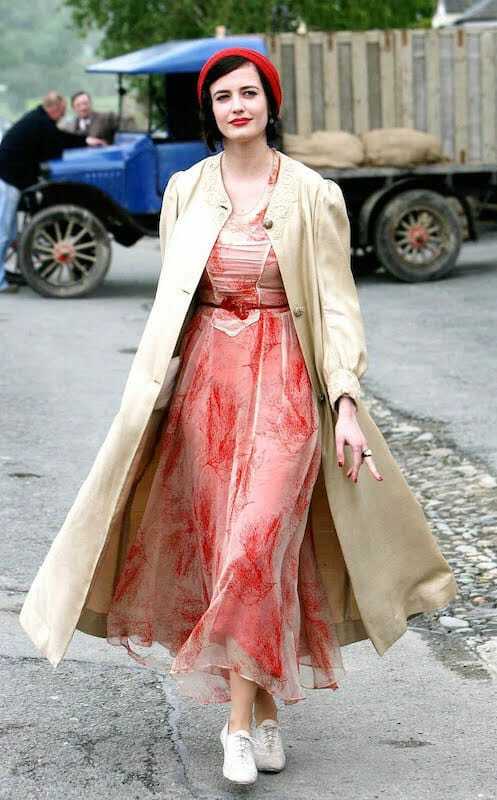 Eva plays Madeleine, the widowed sister-in-law of the protagonist. The dress is actually quite nice, minus the gun! I don’t think things go well for her character. If you’re going to go bleak, GO BLEAK. A horror/drama TV series in which various classic gothic characters intermingle. Eva plays Vanessa, childhood best friend of Mina from Dracula, now kidnapped and running into all sorts of scariness. STUNNING costumes by Gabriella Pescucci. All the layered lace! I like the high neck and again, lace. Lots of subtle details here, especially the bit of pink. She was basically made for this look, wasn’t she? 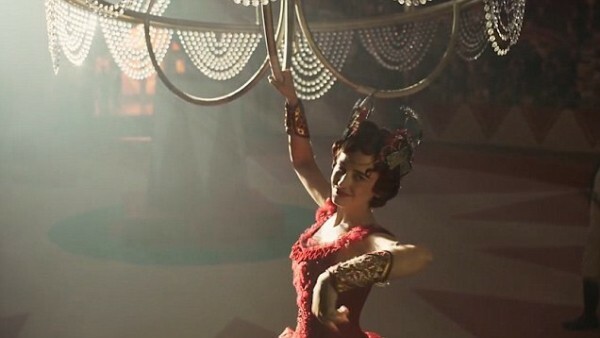 A live-action version of the Disney classic, directed by Tim Burton — so it makes sense that Eva was cast as a French trapeze artist. She looks great in red! And that hair is pretty darn 1930s fabulous. 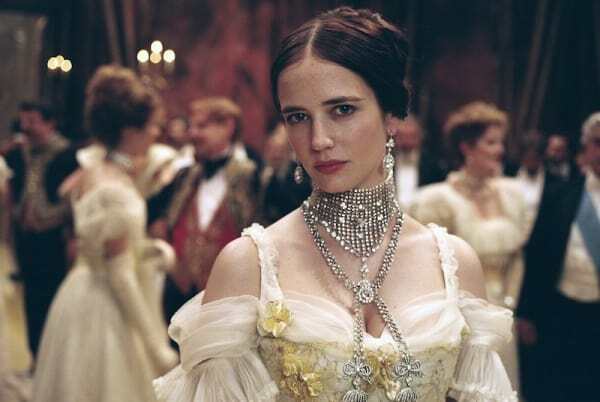 What’s your favorite Eva Green historical costume role? 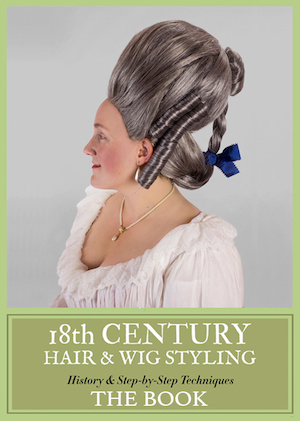 New Year, New Historical Costume Movie/TV Trailers! My favourites are Kingdom of Heaven and Penny Dreadful. And where can I find Cracks? Another favourite is the fantasy Golden Compass. Not sure about Cracks, but it’s worth tracking down! If I can add a bit of a warning: her character in Cracks is a schoolteacher who molests her students. It’s a good movie, because it focuses on the psychological impact of this on the girls, but it is disturbing to say the least. Yes, I’m sure too. The style and hair are totally different! 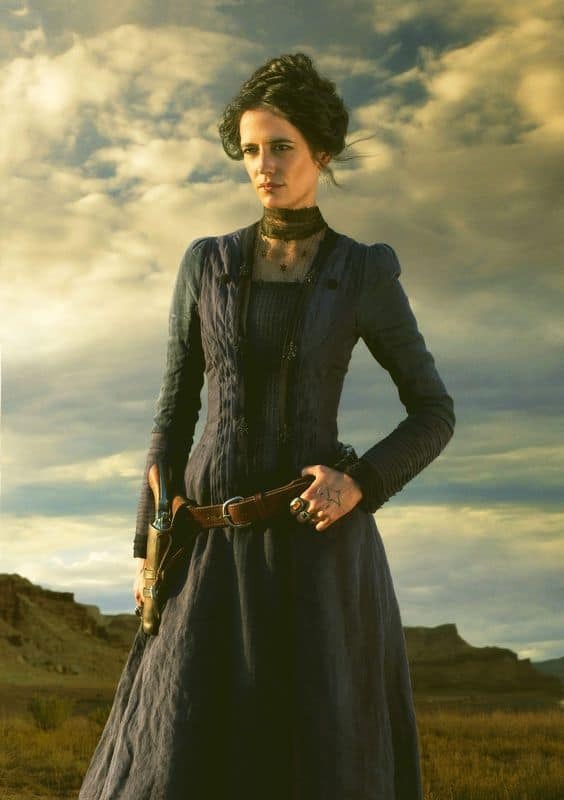 I love Eva, one of my fav actresses, she was flawless in Penny Dreadful, and she as Morgan probably was the only good reason to watch the ill-fated Camelot. Amazing woman! What stuns me about her is that she’s a natural blonde— I can’t imagine her without her dark hair, I was weirded through the 70s portion of Dark Shadows because of it. 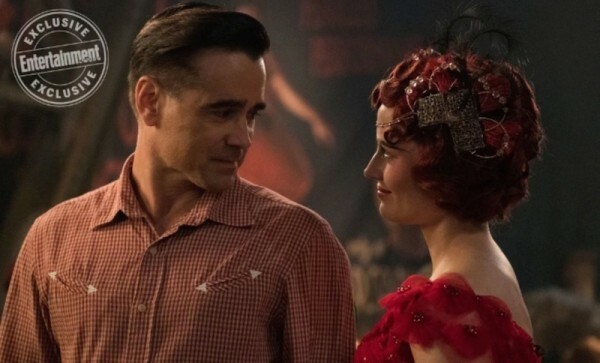 Also, does Miss Peregrine count as a frock flick, since they live in a 1940 bubble, or just another entry in her Burton/steampunk/goth resumé? I thought about including Miss Peregrine but skipped it bc yep, fantasy! Right? I can’t find any pre-dye photos, but there is proof! She’s actually the (nominal) sister-in-law of the villain in “The Salvation.” And because her character’s a mute (she’d been a captive with a native tribe and her tongue was cut out) she spends the entire movie communicating entirely by epic side-eye. Since Mads Mikkelsen doesn’t tend to play loquacious characters either, the movie is a master class in communication via death glare. I love this your answer! Mads Mikkelsen is not a chatterbox? I totally giggled. And reloading?! Well, what is Hollywood coming too, really… Tss, tss, realism. 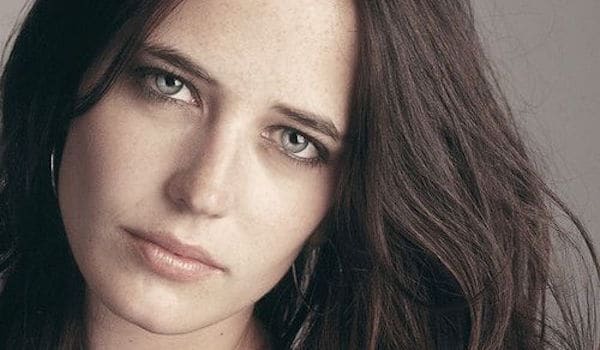 Also, Eva Green is Marlène Jobert’s daughter, and she did inherit her mom’s skin. She also usually has a killer red carpet look! 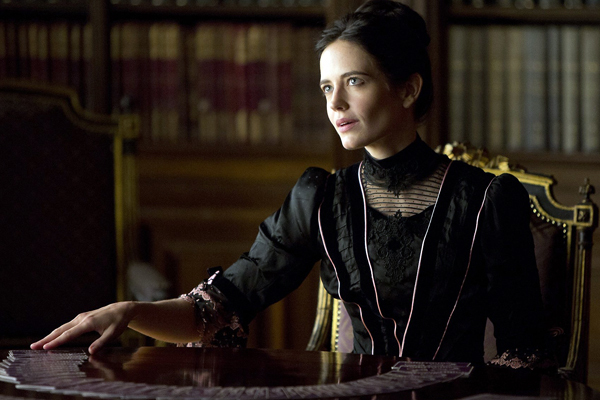 I feel she was born to play Vanessa in “Penny Dreadful”. Green’s ‘Kingdom of Heaven’ are very pretty indeed and completely un-historical – just like the rest of the movie. 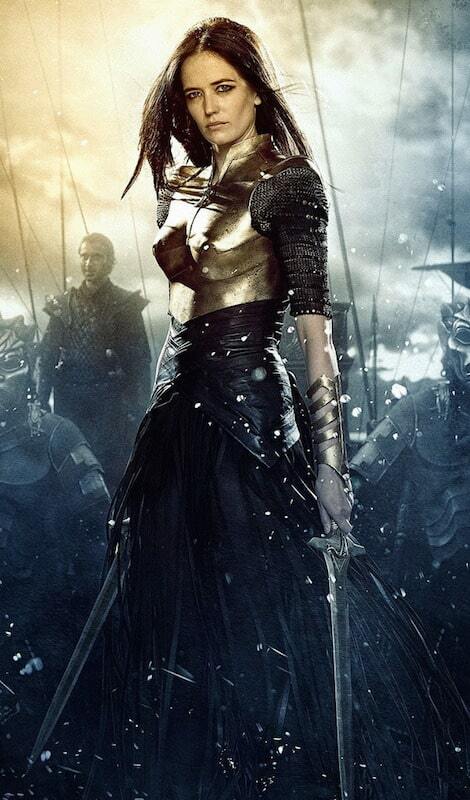 In the ‘300’ sequel she’s playing Artemisia of Caria not a Spartan so the kohl may be accurate. The armor not so much. 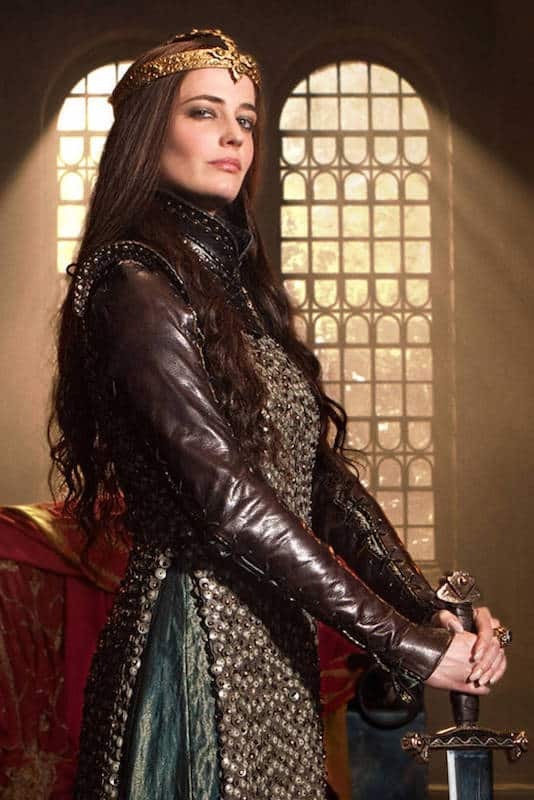 About the only historically plausible thing she was given to wear in the whole of KoH was a straight-up replica of the Byzantine-style crown of Constance of Aragon, the early-13th-century Holy Roman Empress (which she wears not for her own coronation, oddly enough, but for her son’s). It’s the most likely style for a Frankish monarch of Jerusalem to have worn. It’s terrific. The costumes in ‘Kingdom of Heaven’ are intentionally a-historical in two ways: (1) Ridley Scott wanted to push a quite untrue vision of Baldwin IV and Sibylla having a religiously and ethnically tolerant outlook, and therefore wanted her to have costumes with an ‘Arab’ look, rather than the Frankish/Byzantine clothing she would have worn, and (2) costume designer Janty Yates has said she was working to make the Frankish characters look like pictures by late-19th-century medieval-revival artists, rather than the real Middle Ages (though sometimes she just went completely off-piste – when Sibylla poisons her son in the DC she’s dressed like a fashionable 1890s Parisian widow in black lace). 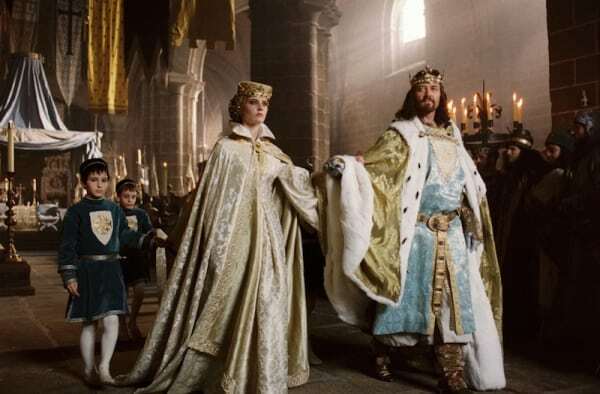 About the only historically credible thing Green wears in the entire movie is the terrific crown she wears at her son’s coronation (though, weirdly, not for her own) which is a straight copy of the crown of Constance of Aragon, Holy Roman Empress 1208-22. Frankly the costumes are the LEAST of Kingdom of Heaven’s problems with history. Mind you it is very pretty to watch. I loved everything about her Morgan character in Camelot. So darkly regal. Ominous chic. Feminine despotic. All fabulous. I think she’s the most unearthly beautiful woman I’ve ever seen, and also a fantastic actress. 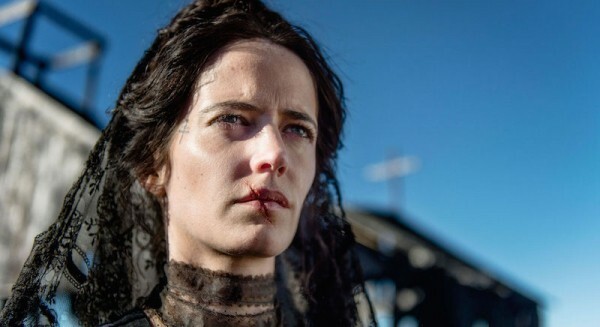 Vanessa Ives felt so personal, a reflection of female passion, desperation, mental illness, and simple kindness I’ve never seen on screen before. The darkness always seems to be given to the male characters, so her depiction was a revelation and a gift for me. While she’s definitely not a bit player, I don’t understand why she’s not one of the leading names.